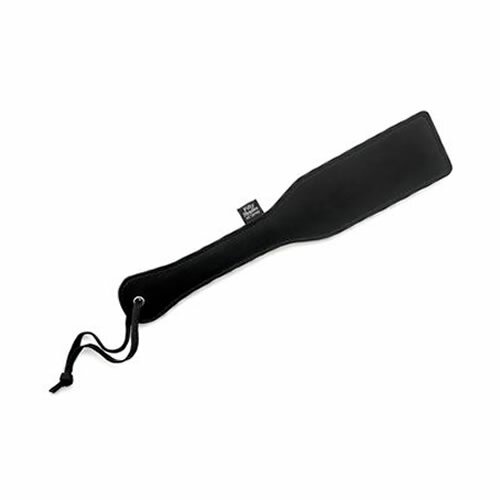 Soft padded satin and firm faux leather offer dual sensation when using this elegant spanker. Start gently with the silky satin to awaken your flesh before building sensation to firmer, sharper spanks with the faux leather side for intensified play. Ergonomically shaped to behave as a natural extension to your own twitchy palm, this sophisticated spanking paddle helps you to naturally slip into your dominant persona. Place the hanging loop around your wrist and enjoy the easy motion of lightly spanking, twisting the paddle to experiment with different levels of sensation. Beneath the silver satin is a cushion of neoprene to diffuse the impact of each hit for a softer, more sensual spank. In contrast, the faux leather side is firm to the touch and has a sharper sting to its swing for a deeper, more resonant hit.